This year we celebrated Black History Month using the theme ‘empower and exceed’ to highlight the steps we’re taking to ensure talented people from ethnic minority backgrounds are represented at all levels of the Civil Service. The Civil Service is the most diverse it has ever been, but we recognise that there is still more work to do. The recently published the Civil Service Diversity & Inclusion Strategy which sets out our collective commitment to becoming the most inclusive UK employer. This includes steps to increase applications from people from lower socio-economic backgrounds. Sahil’s inspirational story highlights the importance of having a strong strategy for diversity and inclusion across the Civil Service. My name is Sahil Afware and I work as the Business Manager to the Principal Private Secretary to the Secretary of State for Justice. Social mobility is an area that is close to my heart and something that’s important to talk about during Black History Month. It is important that we recognise the diverse experiences of staff and encourage inclusion through wider system change as set out in the Civil Service Diversity and Inclusion Strategy. We know what social mobility means, but what does it look like, how can we identify it? There is no simple answer. It can affect all of us, regardless of our gender or ethnic background. Statistically some groups are affected more than others, but nonetheless the issues affect everyone and anyone. I am passionate about social mobility and even more passionate about a particular strand of it – care leavers, or those who have spent time in care. This passion has been with me since the age of 14 when I stood up in Westminster and questioned a Minister on policy regarding children in care. I spent 18 years of my life in care and moved four times as child as my placements broke down. Some broke down because of neglect, while others broke down because of physical abuse. The difficulty the local authority had was where would they find a half Egyptian, quarter Indian and quarter Brazilian family to look after three young children? During my time in care I never got to live with my siblings and I was separated from my identical twin brother. At the age of 14 I realised that I didn’t want to be held back by my experiences. The majority of children I knew had been in some form of trouble and there seemed to be a stigma about the aspirations of children in care. I disagreed with the stereotype and wanted to prove to myself, and others, that you can aspire to be anything you want to in life and you can do so if you are given fair access to opportunities. After making a desperate call to a young person’s helpline, I was signposted to Become, a charity formerly known as the Who Cares? Trust. As a young person in care I wanted to challenge people’s perceptions and advocate for system changes. It was important to challenge, empower and exceed. I went to university at 18. I saw it as my key to freedom and one of the first steps allowing me to pursue a career in law. I wanted to specialise in youth justice, focused on fostering and adoption. I now work as a child advocate for a national charity, Action for Children, who predominately work with children in care. While I have raised my aspirations and shown considerable resilience I know I would not have been able to get here without the work of the Trust. At the Ministry of Justice I work as part of the Free Representation Unit, where I represent clients in employment tribunals. I recently completed the Bar Professional Training Course which was part funded by the prestigious Inns Scholarship. 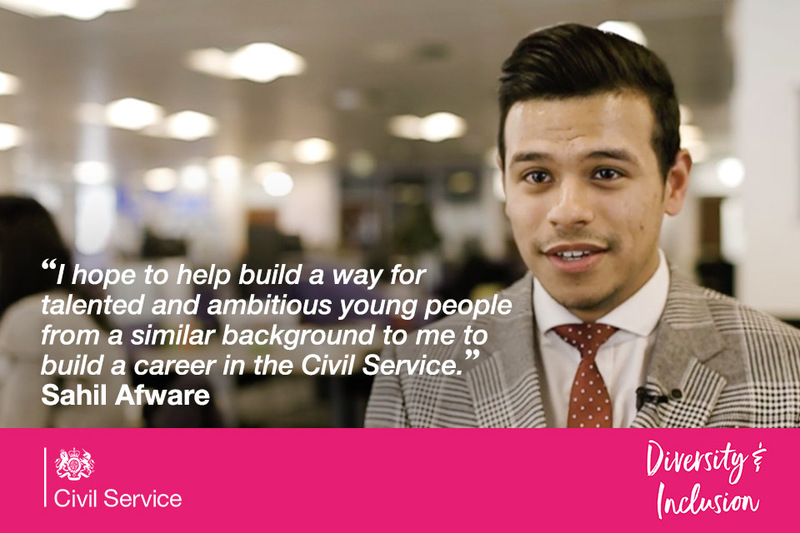 I am actively involved in implementing the new Civil Service Diversity and Inclusion Strategy and hope to help build a way for talented and ambitious young people from a similar background to me to build a career in the Civil Service. I would encourage young people from all backgrounds to apply to join the Civil Service directly or through our Fast Track, Fast Stream or Summer Diversity Internship programmes. We are an organisation that encourages and inspires social mobility within our workplace and we should celebrate this. Unless issues like these are spoken about you will never learn how many obstacles the person sitting next you has overcome to get to where they are. It may be perceived as awkward in some situations, but speaking about these things will help make the Civil Service a great place to work. Inspirational story....All the best for the future Sahil. The civil service is an excellent employer to work for, I should know as I have just completed the operational delivery profession apprenticeship. I am also a mentor for the Cross Government Buddy Scheme and I am based in the County Durham Service Centre. Thank you for sharing this wonderful and inspirational life story. Congratulations on everything you've achieved so far and best wishes for the future. Sahil, thank you for sharing your inspirational story and for everything that you're doing to encourage young people from similar backgrounds. Well Done! Thanks for sharing your life story on this forum...A truly moving, sentimental experience and it just goes to show that despite any form of challenges, the castellated towers can be crashed/broken to overcome adversity and propell one to greater heights...I commend you for your story is so galvanizing.... Congratulations!!!! Thank you!! Thank you for sharing your experiences, Sahil. I too was in foster care during my teenage years and have always found it difficult to speak about due to the stigma attached to it, so know the courage it will have taken you to have spoken out like this. This goes to show that you can do anything you set your heart to. Well done Sahil! Sahil all the very best for the future. You are a prime example of someone who wants to succeed and will succeed. You have come a long way and God willing will go further. Good luck for a very bright future. Sahil - You are indeed a role model for young people, you have shared your struggles and hardship and shown that with the right support, it is possible to overcome difficulties and become successful. The civil service is lucky to have you! Thank you for sharing your story and all best wishes for your future! Sahil's story is inspirational. However, there are many who have been in care who will carry the trauma around of past experiences with them always and this does impact on their performance to work. Linking this to inclusion and diversity, employers should take into account how these experiences, which have set an emotional template for life, will affect many who have been in care and experienced childhood trauma. For example, they can be disorganised, have a very negative view of themselves, be uncomfortable about expressing a need or for help, show a lack of empathy and be particularly vulnerable to emotional and social problems.